The all new Beneteau 373 offers more light and brightness plus extra headroom for commodious space below. The cockpit is very spacious and ergonomic. The cunningly designed removable helmsman's seat simplifies access to the bathing platform, whilst the removable door step makes the companionway very practical. Unrivalled circulation is possible thanks to the brand-new,patented, steering wheel, which can be swiveled to clear the cockpit, still leaving all the instruments on the helm pedestal. The Beneteau Oceanis 373 is a classic sailing yacht with eye-catching appeal. 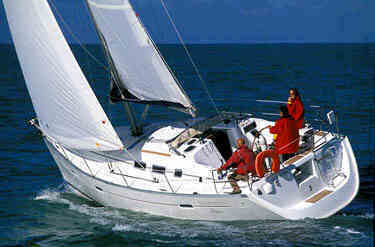 The Beneteau OC 373 has three double cabins, one forward and two aft and one head with shower. We recommend a maximum of 6 people for the ultimate enjoyment in yacht charter pleasure. The Beneateau Oceanis 373 has classic slab and roller reefing, one wheel steering and a electric anchor winch. There is a bimini and dodger, an ondeck shower and BBQ,AM/FM radio & CD player, fully equipped galley with LPG stove & oven, fridge/freezer, pre-charter cruising guides, full boat and chart briefing. Optional extras include an outboard engine for the tender, sea kayaks, a skipper and a provisioning service.